Episode #92: ACTION COMICS WEEKLY! With the release of the 12th and final weekly issue of WEDNESDAY COMICS, this is the perfect week for DC's first weekly comic book, ACTION COMICS WEEKLY. It ran from issue #601 - 642, from April 1988 - January 1989. Each issue was about 48 pages and contained 7 - 8 page stories of a variety of characters. Each story would run for about six or seven issues, and the cast of main characters featured would rotate. Superman was about the only character that appeared in each issue, in a two page comic strip style story, that was not my favorite of A. C. WEEKLY. My favorite stories during Action's weekly run involved BLACKHAWK. These are the only issues I have: #601 - 609, 615 - 622 and 628 - 635. 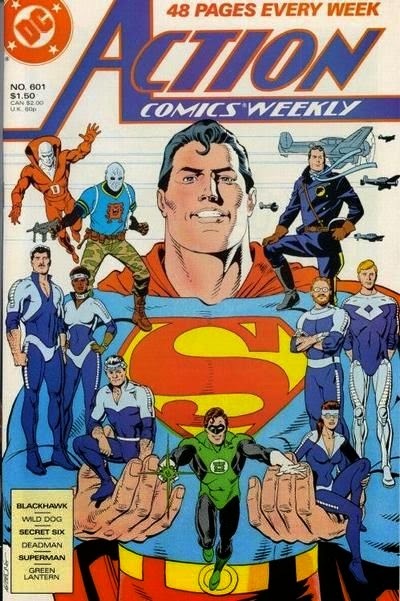 In this episode I review the basic plot of the Superman story and, in a SUPERMAN FAN PODCAST first, the three BLACKHAWK stories, which led to a short 16 issue BLACKHAWK title in 1989 - 1990. At the expanded show notes blog I will list the titles and creative teams of the stories for each issue. And at MY PULL LIST blog I will begin a bi-weekly review of these BLACKHAWK issues. Superman Fan Podcast is a proud member of the Comics Podcast Network! http://www.comicspodcasts.com . SUPERMAN FAN PODCAST can be found at http://supermanfanpodcast.mypodcast.com . Send e-mail to supermanfanpodcast@gmail.com . Episode #91: Happy Birthday, Mike Grell! Mike Grell was born on September 13, 1947. He is most well known for his work with DC Comics, on the LEGION OF SUPER-HEROES, GREEN ARROW and his own creation, WARLORD. - http://www.mikegrell.com - Mike Grell's official web site. - http://aquamanshrine.blogspot.com/2009/02/aquaman-shrine-interview-with-mike.html : about how Mike Grell first got his jop with DC Comics. Next week: ACTION COMICS WEEKLY! You can join the SUPERMAN FAN PODCAST and MY PULL LIST groups on facebook, and twitter @supermanpodcast . The website for SUPERMAN FAN PODCAST is http://supermanfanpodcast.mypodcast.com . Send e-mail about this podcast to supermanfanpodcast@gmail.com . Episode #90: Superman In Exile: Part III! (Top L to R:) Superman 30 & The Adventures Of Superman 453! (Bottom L to R:) Superman 31 & The Adventures Of Superman 454! 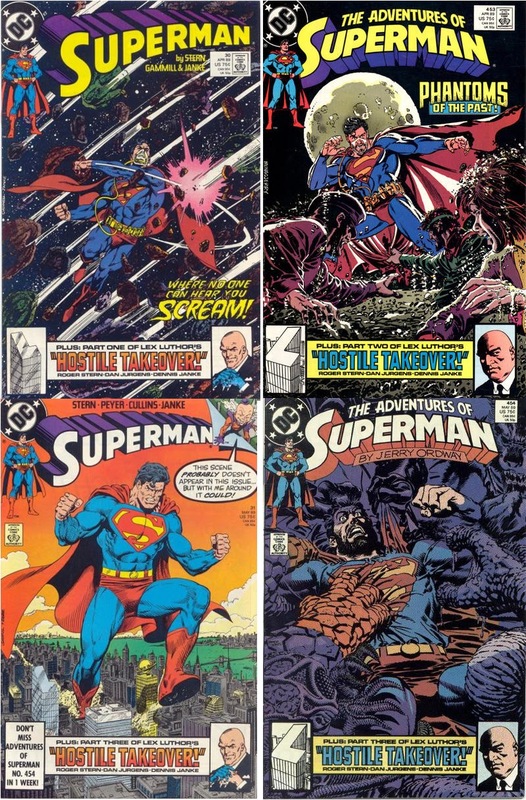 The issues covered in this episode are the Superman titles cover dated April and May 1989. - SUPERMAN #30, published on February 21, 1989. - THE ADVENTURES OF SUPERMAN #453, February 28, 1989. - SUPERMAN #31, March 21, 1989. - THE ADVENTURES OF SUPERMAN #454, March 28, 1989. ACTION COMICS was published weekly at this time and had returned to an anthology title. The Superman story inside was not related to the SUPERMAN IN EXILE story. For a complete list of the Superman titles involved in the SUPERMAN IN EXILE storyline, go to the SUPERMAN FAN PODCAST BLOG at: http://supermanfanpodcast.blogspot.com/2009/04/superman-fan-podcast-special-blog.html . - EPISODE #66: SUPERMAN IN THE POCKET UNIVERSE! - EPISODE #69: SUPERMAN GOES GANGBUSTERS! - EPISODE #71: SUPERMAN IN EXILE: PART I. - EPISODE #72: SUPERMAN IN EXILE: PART II. You can join the SUPERMAN FAN PODCAST and MY PULL LIST groups at facebook. Episode #89: Superman Returns In SUPERMAN #82! Superman (vol. 2) 82 & variant cover! SUPERMAN #82, October 1993 (1993 Triangle issue #30) was published on August 24, 1993. It featured the return of Superman to his iconic blue, red and yellow uniform after his death and rejuvination. - THE DEATH AND RETURN OF SUPERMAN OMNIBUS, published on September 12, 2007. - ACTION COMICS #683 (1992 #44). - ACTION COMICS #684 (1992 #48). FFAF Part VIII: SUPERMAN #77 (1993 #10). 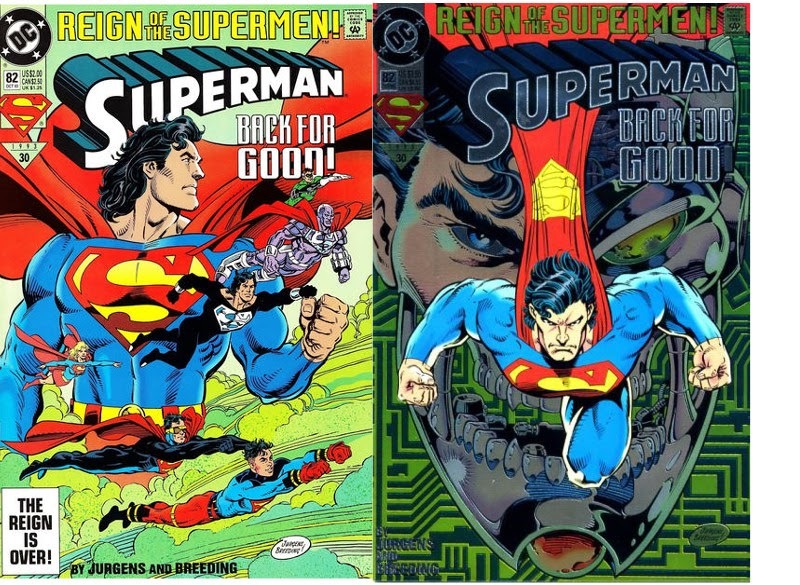 NOTE: These Superman issues were all published on the same day of April 27, 1993. - ACTION COMICS #689 (1993 #20). - ACTION COMICS #690 (1993 #24). - ACTION COMICS #691 (1993 #28). I recently was a guest host on Scott Gardner's BACK TO THE BINS episode #21 on his podcast TWO TRUE FREAKS! The link to the episode is: http://media.libsyn.com/media/twotruefreaks/Back_to_the_Bins_-_Episode_21.mp3 .